Photo by @dregar. More twitter pics of scene here. Update: The bodies of two suicide bombers have been located in the debris. Indonesia authorities are blaming Muslim extremists and say that the perpetrators rented rooms in the hotel. A police spokesman Friday said the suspects in the Marriott bombing were staying in the hotel disguised as guests, though he didn't give a number of people suspected to be involved. Police detonated what they described as a homemade explosive found in room 1808. The spokesman described the hotels' security measures as adequate. The suicide bombers used explosive they were keeping in a room at the Marriott, Mr. Danuri said. The first bomb was detonated at the Marriott at 7:47 a.m. local time at the lounge in the lobby, near a meeting of foreign business people. That explosion killed five. 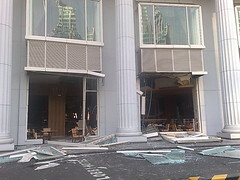 The second bomb was detonated at the Ritz-Carlton Hotel 10 minutes later, on a second floor restaurant, killing two. One person later died in a hospital.